These are the most recent additions to my Hexie Flower Garden. The two flowers on the right in the bottom row are from swap partners and the colours fit in beautifully. I have a favourite flower but it's always the last one that I made or received ! 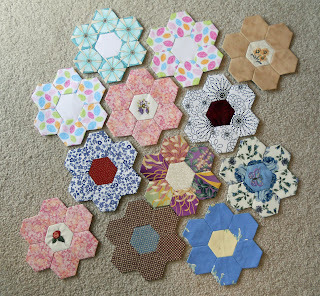 How big are your hexies? And can I swap these with you too? They are 1" hexies. And yes !